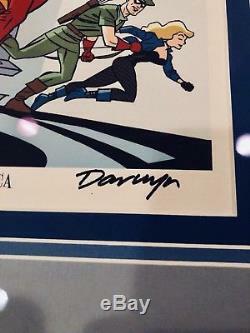 This beautiful Darwyn Cooke signed print is a limited edition from WonderCon 2015. 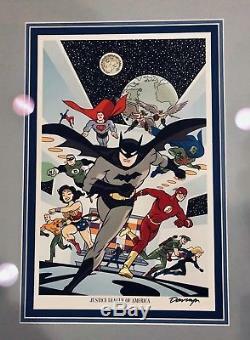 It reproduces the variant cover of Justice League #33, prominently featuring Batman, Superman, Wonder Woman, and the whole gang. Poster is 11 x 17, professionally custom framed with a tasteful light blue matte and black frame. Frame is 20 x 26.5. 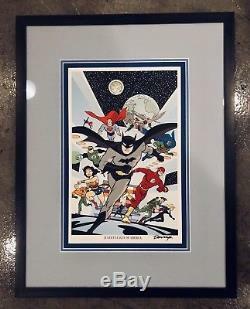 The item "DARWYN COOKE Justice League FRAMED & SIGNED Limited Edition Art Print" is in sale since Sunday, March 18, 2018. This item is in the category "Collectibles\Comics\Original Comic Art\Other Original Comic Art". The seller is "conlan27" and is located in Fresno, California. This item can be shipped to United States.